ANC Economic Transformation Committee chairperson Enoch Godongwana talks about the need for a Vision 2030 for the mining industry. Video and editing: Nicholas Boyd. 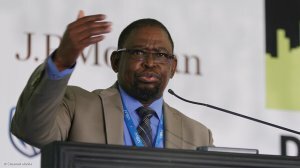 JOHANNESBURG (miningweekly.com) – South Africa is in need of a strategic vision that extends to 2030 for the mining industry, where growing trust between industry stakeholders points to a common vision being achievable, African National Congress (ANC) Economic Transformation Committee chairperson Enoch Godongwana said on Wednesday. His keynote call for a long-term strategic vision received nearly 90% digital voting support from the packed Joburg Indaba conference, where Godongwana emphasised the need to modernise mining. He told the conference, attended by Creamer Media’s Mining Weekly Online, that a decision had been made not to be lukewarm on the National Development Plan (NDP) and the key focus of an upcoming meeting would be on how to implement the NDP in five-year chunks. He noted gold’s massive decline since 1995 and the halving of mining’s employee complement to less than 500 000 people. On the electricity front, he identified private sector investment into Eskom as the most appropriate way to recapitalise the State electricity utility. On the issue of long, violent strikes, he said progress had been made in achieving a common understanding of the interventions to be made in the event of a protracted strike and the need for secret ballots when trade unions gauged popular support for industrial action. Policy-wise, finalisation of the Minerals and Petroleum Resources Development Act Amendment Bill is expected during this session of Parliament, before the end of the year. He advocated that practitioners rather than lawyers solve the Mining Charter’s once empowered, always empowered issue. “Let’s have a negotiated settlement that defines what we want to achieve,” he urged, while making it clear that the ANC is acutely aware of the challenges currently facing the South African economy, and the mining sector in particular. “What is needed is a strategic vision, a vision 2030 for the industry. Government must develop this vision, which the ANC has adopted. That is what is needed,” Godongwana said.